Christianity stands as India's third largest religion, following Hinduism and Islam. Abrahamic religions on the whole date back about 2500 years with the arrival of Judaism, followed by arrival of Christianity around 2000 years ago. Vasco da Gama, seeking preexisting Christian nations in India, discovered a sea route to India by circumnavigating the Cape of Good Hope which caused a major influence on both the histories of Asia and Europe. The 2001 census recorded over 24 million Indian Christians, comprising 2.3 percent of the country's population. Three main regional concentrations of Christian population exist, namely in South India, on the Konkan Coast, and among tribal people in East, Central, and North-East India with the southern state of Kerala, contributing 25 percent of the total Christian population in India. 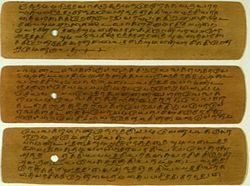 A set of palm leaf manuscripts from the fifteenth century or the sixteenth century, containing Christian prayers in Tamil. The dawn of Christianity to South Asia dates back to the arrival of Saint Thomas to Kodungallur in Kerala in 52 C.E. and establishment of the Seven Churches. Subsequently as a carpenter he offered to build a palace for the Indo-Parthian king Gondophares, later converting the king's daughter and her newlywed groom. before returning to Mylapore, Chennai in 72 C.E. where he attained martyrdom. Most of the sources of information on the arrival of Christianity in India come from the Acts of Thomas and a few more oral traditions recorded on documents in later centuries. The Nasrani Menorah, the symbol of the Syrian Malabar Nasrani Christian community in South India. The Syrian Malabar Nasrani people represent an ethnic community in Kerala, South India. Their tradition goes back to the beginnings of first century Christian thought and the seven churches established by St. Thomas the Apostle among the natives and the Jewish diaspora in Kerala. They follow a unique Hebrew-Syriac Christian tradition which includes several Jewish elements along with some Hindu customs. Their have a Syriac-Keralite heritage, their culture South Indian, their faith, St. Thomas Christian, and their language, Malayalam. According to the Acts of Thomas, Thomas's first converts in India had been Malabari Jews, who had settled in Kerala since the time of King Solomon of Israel. Historians generally agree that St. Thomas, a Jew himself by birth, visited India in search of Jews settled here. Although the Christian ideals had been foreign, many Hindus embraced the ideologies of baptism because of its similarities to bathing in the Ganges, first mentioned in the Rig Veda, the Mahabharata, and the Devi Bhagvatam. After evangelizing in Kerala and Tamil Nadu, the Apostle appears to have been martyred at St. Thomas Mount in Chennai and buried on the site of San Thome Cathedral. Members of the Syro-Malabar Church, an eastern rite of the Catholic Church, adopted the Syriac liturgy dating from an unknown period before the fourth Century. In the fourth century, at the instance of Bishop of Edessa of the Kerala Church, removed Apostle’s relics to Edessa, later moving them to Italy. The Christian community founded by St Thomas has since developed into a number of churches during the Portuguese persecution, including Syriac-rite churches in communion with the Roman Catholic, Antiochian Orthodox churches, and "Nestorian" churches. The arrival of St Thomas, and the subsequent establishment of the seven and a half churches, has been viewed with skepticism by Western historians. The theory has never been discounted, and the Keralites historically attribute an apostolic origin to their church. The Syrian Malabar Nasrani community was further strengthened by various Persian immigrant settlers. The trade routes brought with them not only riches but also stateless nations and nascent worldviews. The community was strengthened by Christian-Jewish Knanaya colonies of third century, Manichaeanism followers and the Babylonian Christians settlers of fourth Century, the seventh Century Syrian settlement of Mar Sabor Easo & Proth, and the immigrant Persian Christians from successive centuries. The Kerala Syrian Church was in communion with Syrian Church and was under the jurisdiction of Patriarch of Babylonian till the Portuguese arrival in the late 15th century. Bishops came from Syria. They seem to have maintained their identity for a long time in the first few centuries and later amalgamated into one patronized community known differently as Nasrani, Malankara Christians, Syrian Christians. The archaeological excavations at Pattanam show that the ancient port town of Muziris was in modern Kerala. The Periplus of the Erythraean Sea calls it of “leading importance” describing it: “Muziris, of the same kingdom, abounds in ships sent there with cargoes from Arabia, and by the Greeks; it is located on a river, distant from Tyndis by river and sea five hundred stadia, and up the river from the shore twenty stadia." The South Indian epic of Manimekalai (written between second and third century CE) mentions the Nasrani people by the name Essanis referring to one of the early Christian-Jewish sect within the Nasranis called Essenes. The embassy of Alfred in 833 C.E. described the Nestorian Syrian Christians as being prosperous and enjoying high status in the Malabar coast. Marco Polo also mentioned the Nasranis and their ancient church in the Malabar coast in his writings Il Milione. The Sacred Heart Church of Chandannagar (l'Eglise du Sacré Cœur), West Bengal, reflects typical French architecture. Portuguese missionaries, who reached the Malabar Coast in the late fifteenth century, made contact with the St Thomas Christians in Kerala, and sought to introduce them to the Roman (Latin) Rite. Since the Eastern Christian Churches served the priests for St Thomas Christians, they followed Eastern Christian practices at that time. Throughout that period, foreign missionaries also made many new converts to Christianity. That led to the formation of Latin Catholics in Kerala. Latin Catholics in Kerala today comprise of St Thomas Christians who accepted Latin (Roman) Rite, found mostly in central Kerala, and the Christians converted by Portuguese influence and other missionary work, found mainly in the southern parts of Kerala. With the Papal bull Romanus Pontifex the Portuguese received the patronage for the propagation of the Christian faith in Asia. 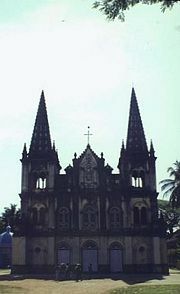 The Portuguese colonial government in Goa supported the mission in India with incentives for baptized Christians. They offered rice donations for the poor, good positions in the Portuguese colonies for the middle class and military support for local rulers. Early Roman Catholic missionaries, particularly the Portuguese, led by the Jesuit St Francis Xavier (1506-52), expanded from their base on the west coast making many converts. Portuguese missionaries sought to convert the entire Hindu population of Goa. As a result of Portuguese incentives many converted Indians had been opportunistic Rice Christians, who even practiced their old religion. Seen as a threat to the integrity of the Christian belief, St. Francis Xavier, in a 1545 letter to John III of Portugal, requested an Inquisition be installed in Goa. Rome fulfilled the request eight years after Francis Xavier's death. During the Goa Inquisition, the Portuguese, forced Hindus to convert; many who refused received summons to appear before the Inquisition charged with heresy and suffering death by burning alive in public. Modern-day Goa has a substantial Roman Catholic population; around 30 percent of the population professes the Roman Catholic faith. The undecayed body of Saint Francis Xavier remains in public view in a glass coffin at the Basilica of Bom Jesus in Goa. Beginning in the eighteenth century, Protestant missionaries began to work throughout India, leading to the growth of Christian communities. In 1793, William Carey, an English Baptist Minister came to India as a Missionary. He worked in Serampore, Calcutta, and other places as a missionary. He started the Serampore College. He translated the Bible into Bengali. He worked until his death in 1834. Anthony Norris Groves, Plymouth Brethren missionary came to India in 1833. He worked in the Godavari delta area. He worked in India until his death in 1852. Mormon missionaries, including Hugh Findlay, arrived in Bombay and Pune in the early 1850s, but meet with little success. 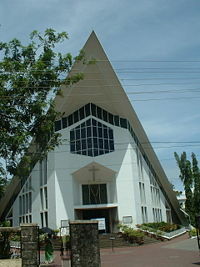 A Roman Catholic Church in Kochi. The total number of Christians in India according to the 2001 census numbered 24.08 million (2.40 crores), or 2.3 percent of the population. About 70 percent of Indian Christians in 1991 declare themselves Roman Catholics, including 300,000 members of the Syro-Malankara Church and 3.5 million (35 lakh) of the Syro-Malabar Church. 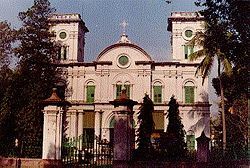 In January 1993, the Syro-Malabar Church and in February 2005 Syro-Malankara Church rose to the status of major archiepiscopal churches by Pope John Paul II. The Syro-Malabar Church constitutes the second largest among twenty two Eastern Catholic Churches who accept the pope (Bishop of Rome) as the "visible head of the whole church." Most Protestant denominations have representation in India, the result of missionary activities throughout the country. The Church of South India, since 1947 a union of Presbyterian, Reformed, Congregational, Methodist, and Anglican congregations embodies the largest Protestant denomination in the country with approximately 2.2 million (22 lakh) members as of 1995. A similar Church of North India had 1 million (10 lakh) members. (Those churches have full communion with the Anglican Communion.) The Mar Thoma Church, which derives from the Syrian Orthodox Malankara Church, numbers 1 million and communes with the Anglicans, but as qualified member. About 1.3 million (13 lakh) Lutherans, 473,000 Methodists, and 425,000 Baptists live in India as of 1995. Oriental Orthodox churches of the Malankara and Malabar rites totaled 2 million (20 lakh) and 700,000 members, respectively. Pentecostalism, another denomination of Protestantism, has been rapidly growing religion in India, spreading greatly in northern India and the southwest area, such as Kerala. The India Pentecostal Church of God (IPC) constitutes the largest indigenous Pentecostal church in India. The Brethrens represent another prominent group, known by different names such as Plymouth Brethren, Indian Brethren, and Kerala brethren. During the twentieth century, the fastest growing Christian communities have been located in the northeast, among the Khasis, Mizos, Nagas, and other hill tribes. Today Christians have their largest numbers in the northeast (secessionist movements in a few states such as Nagaland have been demanding an independent Christian-majority entity), and in the southwestern states of Kerala and Goa. Indian Christians have contributed significantly to, and have been well represented, in various spheres of national life. They currently serve as chief ministers of the states like Andhra Pradesh, Nagaland, Mizoram, and Meghalaya, as well as chief ministers earlier of Kerala, Manipur, Goa, and Chattisgarh. In the powerful election committee of the ruling Indian National Congress party, they hold four out of twelve places. Historically, Hindus and Christians have lived in relative peace since the arrival of Christianity in India during early part of the first millennium. The arrival of European colonialists brought about large scale missionary activity in South India and North-East India. Many people from the indigenous cultures converted to Christianity, sometimes voluntarily and other times violently and forcefully. The Goa Inquisition provides an example of forced conversions imposed on Hindus, Muslims, and Jews in India. Hindus who converted to Christianity typically retained their social customs, including caste practices. Christian missionaries under British rule have been charged with aggressive proselytizing that led to resentment among Hindus and Muslims in the nineteenth century. That may have been a contributing cause of the Indian Rebellion of 1857 against the British Raj. Many Christian ideals prompted reform movements within the Hindu society in the 19th century, the most notable being the Brahmo Samaj, influenced by British Christian Unilateralism. Indian Christians have retained Hindu customs and practices, and have combined Hindu customs with Christianity to achieve a unique brand of Indian Christianity. For instance, many Christians in India celebrate the Hindu festival of Diwali. That form of syncretism presented the Christian churches in India with a perplexing dilemma, requiring theological reflection on the interface of Hinduism and Christianity. For the most part, Indian Christians rejected religious exclusivism and have chosen to coexist with Hindus in peace. In more contemporary periods, Hindu-Christian amity has been sometimes challenged by partisan politics and extremism from both communities. Christian missionary activity among lower-caste Hindus has created groups of Crypto-Christians, particularly among Dalits. Among Catholics, discrimination against Dalit Christians has remained strong within quarters of the Catholic Church, perpetrated by upper-caste Christian clergy in India. As a response, the Vishwa Hindu Parishad has successfully converted several Indian Christians back to Hinduism. A back lash by the Hindu majority has occurred in four Indian states (Rajasthan, Madhya Pradesh, Himachal Pradesh, and Tamil Nadu mainly) which passed laws restricting or prohibiting conversion to Christianity. That has created some resentment in the Indian Christian community. In July 2006, BJP-dominated Madhya Pradesh government passed legislation requiring people who desire to convert to a different religion to provide the government with one-month's notice, or face fines and penalties. In August 2006, Chhattisgarh State Assembly (also BJP-dominated) passed similar legislation requiring anyone who desires to convert to another religion to give 30 days' notice to—and seek permission from—the district magistrate. There have been some instances of violence between Hindu Nationalists groups and Christians. Human Rights groups like Human Rights Watch alleged Hindutva Hindu Nationalists perpetrated large-scale violence against Christians. There have been sporadic instances of violence between Hindu Nationalist groups like Rashtriya Swayamsevak Sangh (RSS) and Christians, although they have also worked together in many enterprises. For instance, the Hindu Nationalist group Sewa Bharati has collaborated with relief groups, such as the Catholics Bishops Conference of India to conduct relief operations in the aftermath of the 2004 Indian Ocean earthquake. Activities included building shelters for the victims, providing food, clothes, and medical necessities. Also, some Christian priests have come out in support of the RSS. The Government of the state of Tripura has uncovered evidence to support the assertion that the Baptist Church of Tripura has been supporting the terrorist group National Liberation Front of Tripura, a violent separatist group that has attacked and killed Hindus in the region and that has banned Hindu festivals by force. Other Fundamentalist Christian militant groups include sections of the Nagaland Rebels (1947-present), active in predominantly Christian state of Nagaland in Hindu majority India. They had been involved in several bombings in 2004. Muslims in India who convert to Christianity have been known to be subjected to harassment, intimidation, and attacks. In Kashmir, a Christian convert named Bashir Tantray had been killed, allegedly by militant Islamists in 2006. A Christian priest, K.K. Alavi, a convert from Islam, recently raised the ire of his former Muslim community and has received many death threats. An Islamic terrorist group named "The National Development Front" actively campaigned against him. ↑ 1.0 1.1 1.2 1.3 Census India, Population by religious communities. Retrieved January 16, 2009. ↑ Nathan Katz, & Ellen S. Goldberg, The Last Jews of Cochin: Jewish Identity in Hindu India (Columbia, SC, Univ. of South Carolina Press, 1993, ISBN 0-87249-847-6). ↑ Israel J. Ross, Ritual and Music in South India: Syrian Christian Liturgical Music in Kerala, Asian Music, 11 (1) (1979): 80-98. ↑ 6.0 6.1 Stephen Andrew Missick, Mar Thoma: The Apostolic Foundation of the Assyrian Church and the Christians of St. Thomas in India, Journal of Assyrian Academic Studies. Retrieved January 15, 2009. ↑ Tom Shippey, Bibliophobia: Hatred of the Book in the Middle Ages. Retrieved January 15, 2009. ↑ Susan Ashbrook Harvey, Women in the Syrian Tradition. Retrieved January 15, 2009. ↑ Stephen Neill, A History of Christianity in India: The Beginnings to AD 1707 (ISBN 0521548853). ↑ 10.0 10.1 Ronald Daus, Die Erfindung des Kolonialismus (Wuppertal, Germany: Peter Hammer Verlag, 1983, ISBN 3-87294-202-6). ↑ Census of India, Christian in India. Retrieved January 15, 2009. ↑ Encyclopedia Britannica, Christian Caste. Retrieved January 15, 2009. ↑ Hindu Books, Christianity. Retrieved January 15, 2009. ↑ Indian Hope, Article 5. Retrieved January 15, 2009. ↑ Dalit Christians, Arulappa. Retrieved January 15, 2009. ↑ Tribune India, Nation. Retrieved January 15, 2009. ↑ BBC, BBC Article dealing with conversion prohibition laws. Retrieved January 15, 2009. ↑ CSW, Christian News source with allegations of Persecution in India. Retrieved January 15, 2009. ↑ CSW, Anti-conversion legislation enhanced in Indian state as new report condemns abuses of the laws 26/07/2006. Retrieved January 15, 2009. ↑ CSW, Second State government in India enhances anti-conversion laws 07/08/2006. Retrieved January 15, 2009. ↑ HRW, India 1626. Retrieved January 15, 2009. ↑ The Hindu, Relief missions from Delhi. Retrieved January 15, 2009. ↑ BBC, BBC News article explaining links between the Baptist Church of Tripura & the NLFT. Retrieved January 15, 2009. ↑ SperoNews, Christian convert from Islam shot dead in Kashmir. Retrieved January 15, 2009. ↑ Christian Examiner, Convert from Islam in India Remains on Death List, Christian Examiner. Retrieved January 15, 2009. Cox, Jeffrey. Imperial Fault Lines Christianity and Colonial Power in India, 1818-1940. Stanford, CA: Stanford University Press, 2002. ISBN 9780804743181. Neill, Stephen. A History of Christianity in India The Beginnings to AD 1707. Cambridge: Cambridge University Press, 1984. ISBN 9780521243513. Tisserant, Eugène, and E. R. Hambye. Eastern Christianity in India; A History of the Syro-Malabar Church from the Earliest Time to the Present Day. Westminster, MD: Newman Press, 1957. OCLC 3021034. A History of the Church of England in India. Catholic encyclopedia - entry on India. Christian Pilgrimage sites in India. History of "Christianity in India"
This page was last modified on 18 February 2017, at 21:06.